After frogging that ill-conceived ruana and using a niddy-noddy to wind the yarn into skeins last summer, I carefully put all ten or so skeins of that Nature Spun worsted into a basket…and promptly forgot about it. The yarn recently resurfaced, and I determined to get it into usable shape soon. 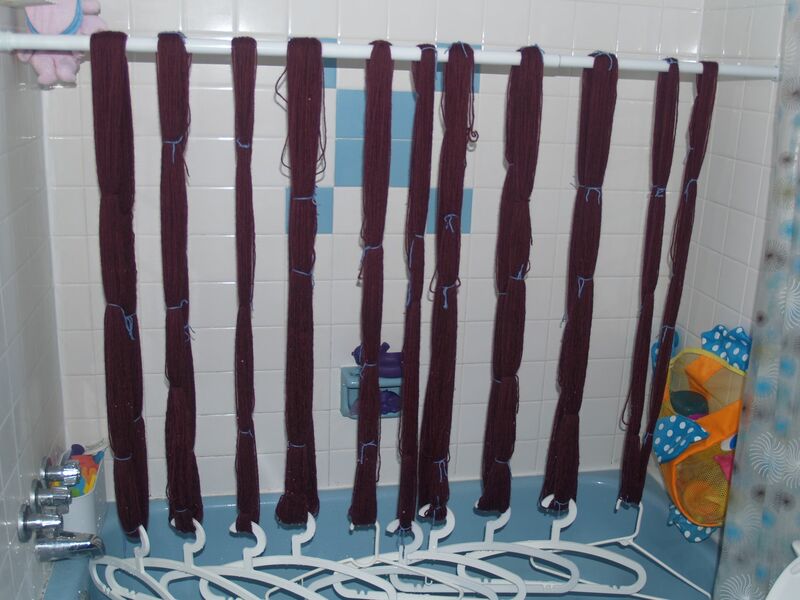 So yesterday morning I filled the bathtub with enough cold water to soak all this yarn, squeezed out the excess water, and hung up the skeins to dry. I’m guessing they’ll be ready in a day or so. In the meantime, the bathroom smells like a wet dog. I love it when you use that imaginary language of yours — “frogging,” “niddy-noddy,” “ruana,” “worsted.” Can’t wait for the next post. Until then, flimmin’ in the jim-jam, frippin’ in the krotz! I love the smell of wet dog in the bathroom. Good thinking. I usually wash my yarn in an extra large bowl or the sink. I actually have a lot of yarn to wash. I just may try this myself.